Cultured Pearls vs. Freshwater Pearls: What's the Difference? 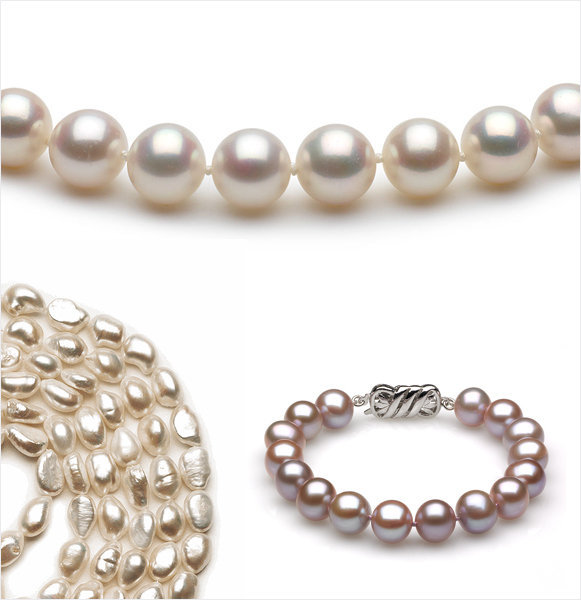 Throughout history, pearls have been treasured in practically every civilization imaginable. One of the reasons why pearls are ador ed and coveted is for their beauty. As pearls earned their reputation as a treasure, they were also used as currency. The most valued pearls were the roundest, largest, cleanest and most lustrous pearls. In the consumer's search for the perfect pearl, labels can be confusing, especially with regard to freshwater pearls and cultured pearls. But what's the difference? And which are the roundest, largest, cleanest and most lustrous? The fact of the matter is this: almost all pearls sold today are cultured pearls, including freshwater pearls. In other words, there is no real difference when comparing cultured freshwater pearls vs. freshwater pearls. The real differentiator is the environment in which they are made, either freshwater or saltwater. Here's how they differ. Saltwater Pearls - Saltwater pearls, including Japanese Akoya pearls, Tahitian pearls and South Sea pearls, are created in saltwater environments. Akoya are the roundest and most lustrous pearls in the world. These saltwater pearls come from oysters inhabiting the oceans of the world. Freshwater Pearls - Freshwater pearls, on the other hand, are the product of mussels that inhabit freshwater lakes and rivers. Technically, if colored freshwater pearls were the largest, roundest and most lustrous pearls in the world, they could be worth as much as saltwater. Freshwater pearls can be round or irregular in their shapes and exhibit unusual colors. White Freshwater and Akoya Pearls are routinely bleached in order to produce a white pearl. Freshwater pearl of the grey, gold, black, pistachio, mocha, dark cream, blue and peacock are color enhanced with a dye. Supply and demand also contribute to the value of pearls. There is a plethora of freshwater pearls available each year, unlike saltwater pearls, whose perfectly round shapes and mirror-like luster make them a true paragon. The difference in availability of freshwater pearls vs. saltwater pearls is why the former are so affordable. Whereas saltwater pearls are investment- grade quality, most freshwater pearls are closer to commercial-quality jewelry in their prices. Regardless of their price or rarity, freshwater pearls are nonetheless beautiful. And when it comes to choosing between a freshwater pearl vs. saltwater pearl, the economical price can be a deciding factor for many customers.